A quarter of a century has gone by since the crime in Ahmići, a village in central Bosnia. The reconciliation process has lasted for decades and is far from being over. On the morning of April 16, 1993, the 4th Battalion of the Croatian Defence Council Military Police (HVO) and the Jokers, the special operations forces of said police, killed 116 Bosniak civilians. Out of those victims, 32 were women and 11 children – the youngest one was only three-months-old. Two hours after the crime in Ahmići, the members of the Bosnian Army’s special unit Zulfikar killed 15 civilians and seven Croatian soldiers in the village of Trusina in the municipality of Konjic (BiH). The perpetrators of the crimes in Ahmići and Trusina, chiefly commanders, were sentenced to long-term sentences, but and some of them only wound up in prison after spending years in hiding. They were assisted in this by the state organs. The Ahmići criminals for a while hid in Croatia from the International Criminal Tribunal for the Former Yugoslavia (ICTY). This was facilitated by the administration of Franjo Tuđman, who was the president at the time. The immediate perpetrators of this war crime – Paško Ljubičić, Vlado Ćosić, Ante Slišković, and Tomo Vlajić – lived in the suburbs of two Croatian cities - Zagreb and Zadar - under false identities. The operation of saving the Ahmići criminals was directed by Markica Rebić, the head of the Croatian Army’s intelligence service at the time. Of course, such a type of purification is primarily expected from the leading members of particular nations. Croatian people, whether they are in Croatia or Bosnia and Herzegovina, lack politicians who would accept the aforementioned human and rational demand that numerous serious crimes were committed in the name of those people on the territory of the Former Yugoslavia in the 90s. This has especially been clear in the last years, particularly in situations when the UN’s Hague Tribunal reached verdicts based on individual responsibility, regardless of the fact if “our guys” were found guilty or not. I was present at the last judgement at the UN’s ad hoc tribunal in the Prlić et al. case. The tragic act of drinking poison, which was done by one of the war crime convicts, showed that here we still live in a culture in which it is more important to fanatically prove one’s “truth and heroics,” than it is to think of one’s family, the ones who love you, and the ones who trust you. Unfortunately, the individual’s tragic act deprived the victims of justice. Instead of lamentation, once again we received reactions from some of the most responsible politicians in Croatia and Bosnia and Herzegovina who negated the facts determined in court and completely forgot the victims, even though the facts, more than ever, emphasised that the verdict was above all the responsibility of the convicted individuals as well as the Croatian political leaders at that time, and not the people of Croatia. Once again, there was no dealing with this in the name of the collective - the members of their own nation, the convicted criminals, were victimised, in a collective lamentation, about the destiny of the people of Croatia who could not commit any crimes in the supposedly defensive war. As we have seen on the example of Serbia in the Mladić case, as well as in some other cases, politicians still identify entire nations with war crimes, which is shameful and unacceptable. No one still cares that the facts determined in the Hague verdicts represent a non-exhaustive source of material for the prevention of crime denial, detailed reconstruction of the past, and genuine dealing with it. It is not the Tribunal's fault that said sources are rarely used or not used at all nowadays and that the public in the region, or the ones shaping the awareness of the public, are interested solely in the final outcome of trials: the verdict and the level of the sentence. At that same time, everything that brought about said outcome – all the findings, determined during rigorous evidence procedures, while fully respecting the rights of the defendants – is being ignored. Unfortunately, Croatia is struggling with the whole process. 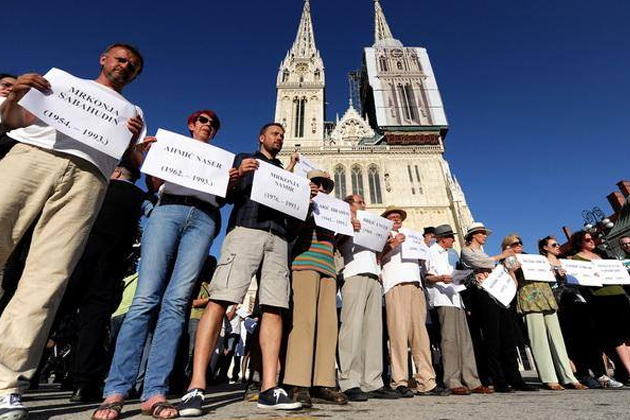 In June 2014, human rights activists invited the citizens of Zagreb to a peaceful protest in front of the Zagreb Cathedral called: “The March in the Memory of the Victims of the War Crimes Committed in the Village of Ahmići.” Those days, Dario Kordić who was convicted for various war crimes, including the one in Ahmići, came to Croatia after serving two thirds of his sentence. He was greeted as a hero by Croatian bishops who waited for him at the Zagreb Airport and also held a service for a man who was convicted by the Hague Tribunal for a civilian massacre in Ahmići. As my colleague Lalić concludes, in Croatia, and other countries of the Former Yugoslavia (especially in Serbia which started the wars in Yugoslavia) there is still the paradox according to which: “certain intellectuals, civil society peace activist, theologians, news reporters, and others who were in no way included in the violence, feel responsible for the brutality and the violation of human rights, while those who committed the crimes, or are politically or morally responsible for the wrongdoings, deny that they had hardly been committed “on our side” or try to justify them and glorify criminals.” On the other hand, the Croatian judiciary is still dealing with a large number of unprocessed war crimes. Out of 490 recorded cases, the perpetrators in 169 of them are still unknown. As time goes by, it will be even harder to investigate crimes committed in the early 90s - there will be less material evidence, as well as surviving victims and witnesses. In its early annual reports, Documenta has warned of the fatigue of both the victims and the witnesses in the repeated statements during criminal proceedings. Mirko Klarin, the founder of the Hague news agency SENSE, pointed out the following in one of the publications issued by Documenta - Centre for Dealing with the Past, a human rights organisation for which I have been working for an entire decade and which deals with processing war crimes: Regional prosecutors inherited hundreds if not thousands of files from The Hague. Those are the files of suspects investigated by the tribunal’s prosecutors, but were let through its net, which was intended for the big fish only. There is no statute of limitations for war crimes and, until recently, we had trials for WW II war criminals in Germany, Hungary, Italy, and other countries. There is no reason not to have this happen in the region in the decades to come.